What to do when the star tenor has taken ill? Just raid the ranks of The Lindemann Program and create a new star tenor! Our disappointment at missing Stephen Costello last night at The Metropolitan Opera's Summer Recital Series evaporated 5 seconds into Petr Nekoranec's performance of "La Donna e mobile" from Verdi's Rigoletto. This young tenor is a stage animal with an appealing presence and a thrilling sound. It is quite difficult to evaluate an amplified voice in an outdoor venue although we admit that the sound was as good as could be expected. We had only the briefest introduction to Mr. Nekoranec last Spring at a Lindemann recital when we loved his voice but not the material. We could tell that he knows how to use his vocal assets to good advantage and has great skill with the three languages in which he sang, that he modulates his phrases effectively, and knows exactly how to shape a decrescendo. If he holds onto the "money note" a bit too long you will not hear a word of complaint from us. We will want to hear him unamplified to learn whether the gorgeous timbre and vibrato impress us as much as it did last night. Likewise we will withhold judgment regarding his suitability for Verdi, which sounded just fine with amplification. But we have no doubt that his bel canto technique is perfectly suited for any type of ornamentation. In "Ah! Mes amis...Pour mon ame" from Donizetti's La Fille du Regiment, he delivered all the high C's without strain, all the while conveying the youthful enthusiasm and excitement of Tonio as he realizes he has won Marie's love. He has a real feel for French and the long luxurious lines of "Je crois entendre encore" from Bizet's Les pecheurs de perles were exquisite. His diction was so fine that we understood every word. He also gave a stirring account of Agustin Lara's 1932 song "Granada", and a charming performance of the strophic aria "Au mont Ida, trois Deesses" from Offenbach's La Belle Helene. Moreover, he "plays well with others", creating the charming Act II "Cherry Duet" from Mascagni's L'Amico Fritz with soprano Susanna Phillips as his Suzel--and also with the Act I meeting between Rodolfo and Ms. Phillips' Mimi from Puccini's La Boheme. Of course, he had a sensational Mimi/Suzel to work with! We confess to being a bit star-struck by this splendid soprano and have preferred her Mozart characters to many others'. Her "Summertime" from Gershwin's Porgy and Bess showed off her gleaming upper register and the portamenti were absolutely stunning. But when she got to "Come scoglio" from Mozart's Cosi fan tutte we realized once again how this artist comes across best when there is a dramatic situation to illuminate. Not only was she astonishing in the wide leaps of this challenging aria, but she put her technique in the service of her character Fiordiligi. This seems a bit trivial but every time she rolled an "r" we got a little thrill. Never too little or too much but just right for the character's personality. With entirely different colors she performed "Song to the Moon" from Dvorak's Rusalka. Although we don't understand Czech (and we'd love to ask Mr. Nekoranec how it sounded to him) we could appreciate the way the music and the lyrics matched so well. The beauty of her singing and the intensity of her dramatic expression brought tears to our eyes as we considered the unhappy end that comes to those who try to be what they are not. Ms. Phillips had some outstanding duets with mezzo-soprano Elizabeth DeShong who debuted at the Metropolitan Opera the same year (2008) as Ms, Phillips. Ms. DeShong has a rich texture to her instrument that reminds us of a Guiness--dark, rich, smoky, with a creamy top! From the Venice act of Offenbach's Les Contes d'Hoffmann, we heard "Belle nuit o nuit d'amour" and cherished the stunning harmonies and barcarolle-type rhythm. The two voices were equally matched and effectively employed in "Serbami ognor si fido...Alle piu calde immagini" from Rossini's Semiramide. We have never seen this potboiler and are thrilled to learn that we will get our chance next season at The Met when Ms. DeShong will sing Arsace, a warrior who finds himself in an oedipal predicament. (Soprano Angela Meade will fill the title role). Thankfully, Ms. DeShong will not be confined to trouser roles. Last night she excelled in roles made famous by legendary mezzo-sopranos making comparisons unnecessary. Her "Cruda sorte! ", Isabella's aria from Rossini's L"Italiana in Algeri was nothing short of powerful. The singer's skill with fioritura was employed in the service of the character. Her versatility as an artist was manifest in "Mon coeur s'ouvre a ta voix" from Saint-Saens's Samson et Dalila. Not only was Samson seduced but so was the audience, yielding to Ms. DeShong's seductive coloring. She was impish in "Nacqui all'affanno e al pianto...Non piu mesta" from Rossini's La Cenerentola, making us wonder what kind of dramatic arc she might create in the entire opera. Orsini's brindisi "Il segreto per esser felici" from Donizetti's Lucrezia Borgia was given a spirited performance; yet another aspect of her talent was revealed in "Sein wir wieder gut" the Composer's aria from Strauss' Ariadne auf Naxos. The fireworks onstage far outweighed the discomfort of the sultry weather. 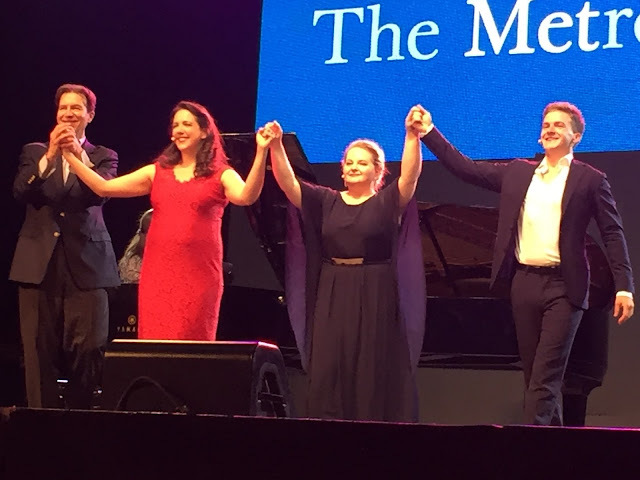 It was a highly exciting evening both from the standpoint of relishing the performances of vocal superstars and from the standpoint of witnessing the versatility of an exciting new tenor. There will be five more recitals in this series; folks in every borough should get a chance to enjoy this gift from The Metropolitan Opera and the Department of Cultural Affairs. Host for the evening was Mary Jo Heath and Dan Saunders provided the superb piano accompaniment.